More often than not, your home’s entryway is the place that sends you off to tackle your day and welcomes you when you return. As such, it deserves a little extra attention. Here are a few helpful tips for creating a gorgeous entryway that whispers a soft and friendly “welcome home” as your family walks through the door. Instead of plain walls staring back at you, consider fashioning a feature wall that acts as a breath of fresh air when you enter your home. Have fun choosing a design, and don’t be afraid to get creative. Whether you choose a solid vibrant color or go with a more unconventional design, keep it tasteful so that your guests don’t want to turn around and run. As shown in this picture, you can carry the pattern into a perfectly positioned piece of furniture for a cohesive, yet striking look. 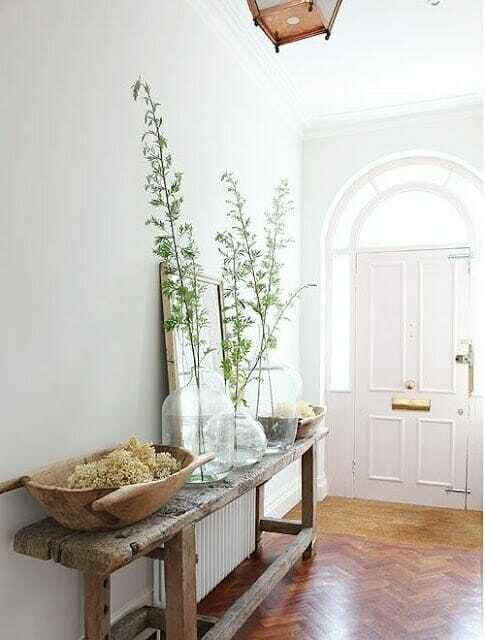 By stationing a variety of plants in your entryway, you let others know that your home is a place where life thrives. Mix it up by selecting different plant and flower species in varying colors to add more interest. Using clear vases, you can upgrade this fresh decor by filling the containers with multi-colored marbles, seasonal acorns, or whatever else your heart desires. Both singular hooks and those attached to mudroom-style organizers are great additions to any entryway. Stationed at the front door, they act as personal attendants who take your coat or hat and keep them handy until the next time you need them. As this picture shows, cushioned seats on a rustic bench provide the perfect place to sit and remove shoes for a cleaner carpet. Whether your children will make use of this feature is a separate matter entirely. For a bright and cheerful “hello,” adequate lighting is a must. 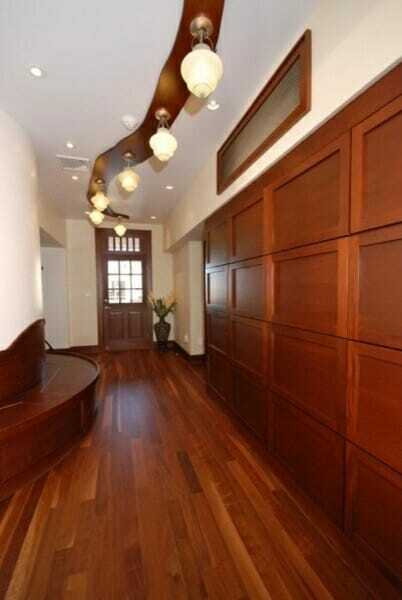 Linear lights like these seem to act as friendly guides that illuminate the path to the rest of your home. From lanterns and pendants to chandeliers and recessed lighting, you can find the right style of lights to suit your space.